Who can sell on Bid4Assets? 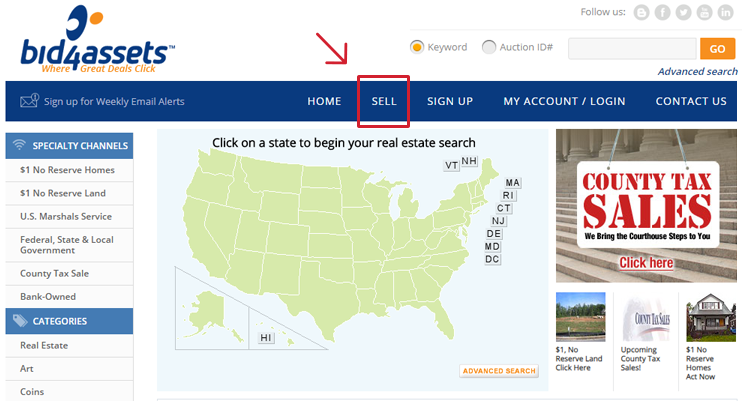 Bid4Assets primarily works with government agencies, real estate funds and small wholesalers. However, we review all new seller applications on a case by case basis. How do I apply to sell? 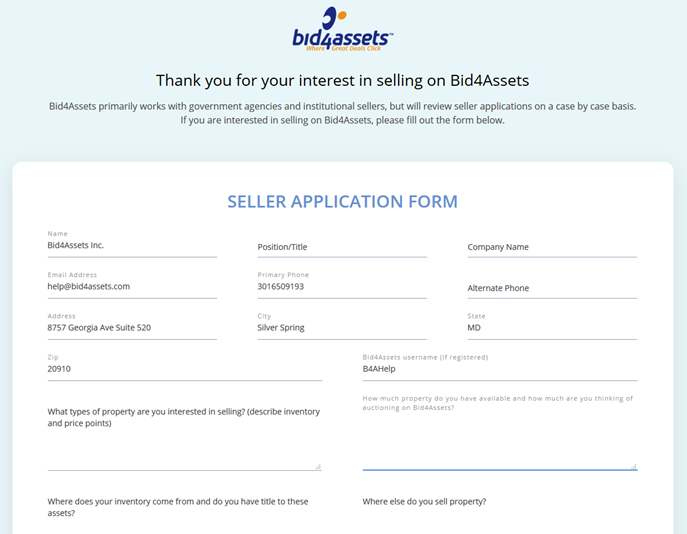 The new seller application form is accessible from almost anywhere on Bid4Assets. Go to the top of whatever page you are on and select the "Sell" icon. This will take you to a page where you can reply to our seller program. Your application will be reviewed by the Bid4Assets Client Services team. You will receive a reply within two to three days of submitting your application. The email will notify you whether you have been approved to proceed to ID Verification. If my application is rejected can I apply again? Yes! Your account allowsd you to apply to our seller program as many times as you would like, We recommend applying when you have multiple properties immediately available to list for best results. After your application is cleared to move forward, the next step is to through Bid4Assets' ID Verification screening. All sellers on Bid4Assets are authorized through an ID Verification Service. The process is free, quick, and secure, and does not influence your consumer file of credit score. Once your application has been approved, you will be contacted by a Bid4Assets representative with instructions to begin ID Verification. If you intend to list primarily as a corporate entity, you will need to fill out a corporate verification form. What happens if I do not pass ID Verification? If you do not pass the ID Verification screening, you will be required to submit an offline verification form to the Bid4Assets Client Services team. To request this form, email [email protected]. Note: If you intend to sell as a corporation you will need to submit a corporate verification form. Please specify this requirement when requesting your offline verification form. Does Bid4Assets Require Proof of Ownership? Yes. In your first three listings with Bid4Assets submitting Proof of Ownership is mandatory. Your auctions will be placed on hold until it has been reviewed and approved. It should be submitted in the form of a county approved deed to the Bid4Assets CLient Services team. Please not that Proof of Ownership can be requested by our Client Services team at any time for any auction.